I’m an unapologetic fan of Matt Drudge’s website. A couple years ago, he (or someone around him) released an official Drudge Report iPhone app. “Excellent,” I whispered, deep within the halls of the Bruce Family Compound. I downloaded the thing the day it hit the App Store and opened it up. I opened it a few more times after that … then deleted it before the week was done. What happened? This was a mobile content app from a website I used almost daily. What happened was, there’s no such thing as “Mobile Content Marketing”. There’s been a lot talk out there in the last few years about mobile marketing. And for good reason: the statistics on mobile usage are staggering. It is evident that the world is making more and more room for smaller and smaller devices, with many foregoing desktop computers altogether. The rise of the 3- and the 9-inch screen has created an entirely new app economy, driven largely by the Apple and Android mobile app stores. Fortunes are being made, technology is advancing daily, new and amazing apps are being built by the minute — and the web content publisher is left wondering and worrying if she’s missing out on the gold rush. In the context of what Copyblogger teaches week in and week out, we’d call this Mobile Content Marketing — that is, if we believed it actually existed. As a web publisher, your options for delivering your words, videos, images, and audio onto the mobile screen are immense. The next step in your mobile content evolution might be to spend some money, working with a developer to build a separate mobile version of your website. In this case, you’re essentially re-creating your site on a mobile subdomain in a single attempt to fit multiple screens. Pay the bill, and you’re better off than if you were merely using a plugin. A third way — the option that much of the tech world is currently evangelizing — is to build an app. In many minds, the mobile app is the holy grail. Paid or not, you’ve poured money, time, and tech into a single portal that (you hope) your audience will download from an app store, and dedicate themselves to opening on their phone or tablet multiple times a week to get at your stuff. But what if there were a simpler, less expensive, and much more effective way to distribute your content into this increasingly mobile world? The dirty little secret of mobile content distribution is that you only need one website to serve every device. Where does that leave us concerning the three options above? A plugin is, well, a plugin. You need to download it, maintain it, make sure it’s compatible with your theme, and with future versions of your theme. You have to remember that it’s there, and you’re stuck with the way it generically presents your content, without the benefit of the branded elements of your web design. A secondary, dedicated mobile site is better, but it’s another site to maintain. As development on the web advances, you’ll need to advance the “the mobile version” of your site with it. This costs time and money. Worse, it costs your attention. Similarly, app development is expensive and time-consuming. When it’s done, your content is distributed via platforms that you don’t own or control. And, you’re asking your audience to take steps to download, update, and remember to open your shiny little app. Compare that to RSS or email, where you deliver content to a location that the subscriber “lives in” for messages and content. Think about it. A content publisher is not building a utility … you are creating and distributing information, ideas, and art. Those are best served on the open web, where they can be indexed by search engines and found by people. You need to focus on creating and distributing informative content. Plugins, mobile sites, and apps take your focus from that objective. There’s only one mobile app a content publisher should concern himself with — the mobile browser. You need a single website that automatically responds to all devices in a mobile browser. Mobile responsive web design is a simple and effective answer to the good, but imperfect, options above. When a website is responsive, the layout and/or content responds or adapts based on the size of screen they are presented on. [Simply put], a responsive website automatically changes to fit the device you’re reading it on. Through the injection of some, well, code (don’t laugh, developers, I’m a writer after all), your single website becomes automatically and beautifully readable on all the devices your audience is using — desktop, laptop, phone, or tablet. If you know what you’re doing with the code, you can make this happen fairly easily. If you’re a writer and publisher online with no hacker credentials, we’ve got a few effortless options you can look at. And yet, I started this post with a somewhat bold declaration: There is no such thing as “Mobile Content Marketing”. With the introduction of accessible responsive design, mobile content marketing has become simply … content marketing. I am a writer, and a reader. As far as content is concerned, I want to read and be read on the open web. I don’t want 300 content apps on my phone. Hell, I don’t even want an app for my favorite website on my phone (see above). I just want to click a link, go to your one website, get what I want, and get out. Responsive design is a great idea to replace a smart App (esp. it cuts down the development cost) and the advantage that i could see is your website will be evenly branded across multiple screens. At the same time, through an App you can deliver customized content according to the screen size, i mean showing what’s more important than showing many things like a regular website…. Good article on mobile. I work with a lot of local business owners and wordpress. A simple trick is to put the phone number above the fold as text not an image. This will make the number clickable to call. More calls = more cashflow. Q: does your mobile theme let you put the phone number as text in the header? I can help with this. 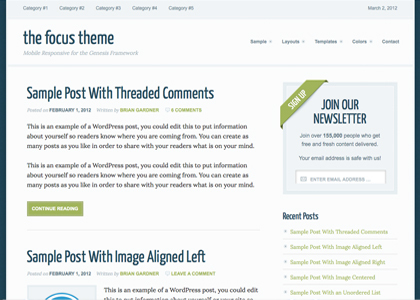 The eleven40 theme (see above) has a dedicated widget area called “page title”. You can insert HTML in this area and it shows up right under the header and navigation on every page – I use it for my optin form and it works wonders. It has almost doubled my conversion rates, which was ridiculously low before I started using eleven40. I’m sure this can work for your clients as well. And you’re right, more phone calls = more leads = more sales. My favorite podcast of yours so far is the one with Steven Pressfield. You have a way of peppering questions to your guest with a grounding manner, part of it with just the calmness of voice. Great post, I could swear that you took a previously excellent post and reworked it for the redone theme. Am I wrong? Way to hook from the start, bring in solid solutions and then sneak in the Prose. This is funny.. I actually deleted the [code] that made my eleven40 theme mobile friendly. Why? There were some elements that I added to the site (to the homepage and custom landing pages) that weren’t showing up correctly on my iPhone. I kept getting emails from people telling me that part of my site was “cut off” and they couldn’t read the text. Great write up by the way Bruce..
Any thoughts on how to keep threaded comments still readable on mobile? If a conversation goes more than three deep it tends to render horribly in the mobile browser. It’s great when an article offers real and usable information. I’m sure that many readers, like me will save time and money with the information you’ve provided. The world of mobile devices seems to get more complicated with each new device or operating system that comes to market. The temptation to build a dedicated app, can seem very overwhelming at times – it seems everyone has one. Apps may indeed be useful for some applications, but as you’ve pointed out, building an app may indeed not be the best way to distribute content. The Olympic motto is Faster, Higher, Stronger. But for mobile distribution, the might might well be, Easier, Cheaper, Simpler. Thanks very much for offering up practical advice that really will be helpful for those seeking to go mobile without losing their shirt, or their mind in the process. WordPress always will be on of my favorite sites for building a website. As soon as I get a little better understanding of it I’m going to redesign ours. Right now it’s the free version and I’m new to this, but I wouldn’t consider anything else. I’m been familiarizing myself with genesis in the last few weeks. Love the things you can do with that. Thanks for all the information Copyblogger has given me over the past few months! Great article. I used WPtouch WordPress plugin, but it wasn’t compatible with some themes’ shortcodes. WPtouch rendered the shortcodes as plain text. So I switched to a responsive layout. 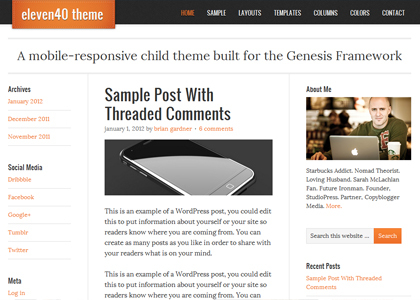 With Twenty Eleven, “responsive” is the default for WP, so I’m glad to see theme developers hop on the bandwagon. Some businesses can afford custom mobile theme and app development, but for budget-minded small businesses, a responsive layout is the most affordable option — especially if it’s baked into the theme. 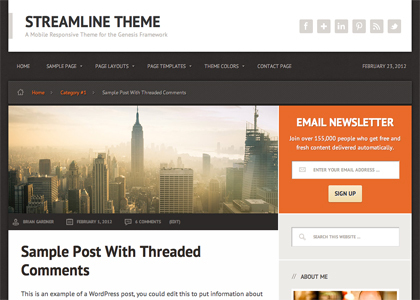 Have been a fan of the studiopress WordPress theme products and currently use the balance theme for a new site. Was anxious for the full realization of HTML 5 in a WordPress theme for mobile devices and desperately didn’t want another plugin or the prospect of developing an app for content delivery (which I viewed as another form of digital share cropping … But that’s for another discussion). The only thing I really wish both Brian’s would finally do with all the theme products at studiopress is make the e-news email sign up form widget come ready for out of the box functionality to use with email providers like Aweber and mailchimp … Because all the mobile responsiveness would be a waste if we couldn’t capture subscribers from those “small little computers” we’re carrying around in our pockets. I like the responsive design, and I’ve been converting most of my sites that way (using eleven forty and streamline) but I am running into issues with sites that are monetized with ads – particularly if I’ve traditionally used AdSense. Google isn’t quite on board with responsive design yet – they do detect the smaller viewport, and serve a “mobile-ish” sized ad, but it’s a little too wide, and breaks eleven forty, at least on my iPhone. And using the traditional ads (such as in a sidebar) is problematic – assuming you scroll down with your finger, you don’t want to generate accidental clicks. 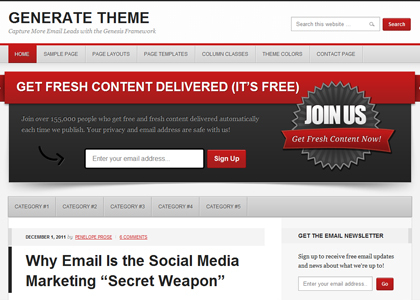 On my sites that do not have advertising (such as my own site), the responsive Streamline works just great. Although I think you’ve outlined one solution, methinks calling mobile content marketing a “myth” is a bit much. One-website-to-rule-them all is an option, but there are plenty of people that prefer content-based mobile apps to mobile websites. And responsive design is a great solution, but doesn’t always create the best experience for the user. Trying to find one solution that works for all means of consumption can be a dangerous proposition. Creating content specifically for the device being used to consume it is the ideal. That isn’t always possible — The cost of money and time may prevent a company taking a device-focused strategy. But let’s at least agree that one comes to this solution not because it is the best for the USER, but because it is best for the BUSINESS. And what’s best for the business isn’t always best for the user. And often, you can come to a solution that is good for the user AND the business. Have you ever used Wired’s app on your tablet? It is a great example of a company that took the device into account, and created a product that one could not create on a website. Their users love it. And in terms of mobile content marketing being a myth, I disagree with that as well. Again, what is the use case for someone visiting a website on their laptop vs. someone visiting a website on their phone? Aren’t they likely to be in a different situation or have a different consumption habit with the device? Wouldn’t I want to market to someone looking at their phone at a tradeshow differently than someone sitting at their desk on a laptop in the middle of the day? The overall problem I had with this post wasn’t that the solution Robert outlines was a bad one…On the contrary, it is a fine option. The problem I had with the post was the position that it was the only right option. A focus on the user’s consumption habits on different devices benefits the interaction with the content, and thus the marketer. Yep, there’s always going to be an exception, but within the context of the content publisher AND the audience, I’m arguing that responsive design is the biggest win. You can’t please all the people all the time, etc., but responsive design eliminates the “mobile content” distinction enough, to allow the vast majority of publishers and audiences to get on with creating and consuming. Somebody else said it in the comments but I’ll repeat it here…WP touch renders [most] sites/themes mobile friendly. Install a plugin and you are done. Have you seen what those sites look like? Generic unbranded blech. Compare that to a responsive design that adapts existing branded elements of the site for a more consistent experience across platforms. Maybe it’s just me, but WP Touch was never an option for Copyblogger. I’ve worked too hard to build this thing to slip it into a generic wrapper for the platforms that are growing the fastest in use. The beauty of responsive web design is that you don’t need to define mobile. You no longer have to ask, what is the cut-off? There are so many different devices that responsive web design offers a form of future proofing your website. The same people who go for a plugin will use a free WordPress design and it shows. I have been looking at Genesis to base a child theme off of but Prose being responsive cinches that for me. It really is well worth the money just to be able to use the Genesis core. well said, Mr. Bruce. Easily the Copyblogger Line of the Week. I must say that I also loved that line very much, Bruce! The rest of the post is very nice, too! Congrats and keep up the good work! “Excellent”, Robert. Appreciate the cut thru the crap post (as usual). cheers brother. Robert – thank you for the push for Responsive Design. You are right, it is the future of “mobile” in that everything should be responsive to mobile devices. We just redid our website (on WordPress) and incorporated a really cool responsive design. Even our large Rotator is interactive on mobile devices – you can slide it with your finger – taking the responsive theme concept one more step in the right direction. Nice article. Responsive web design offers many benefits, including a streamlined content strategy, a consistent brand message, and a reliable user experience across all viewports (if done correctly). 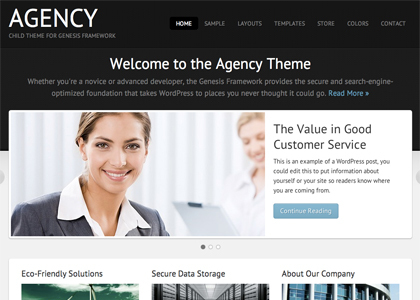 There are many WordPress themes and frameworks utilizing responsive web design. I prefer designing my own framework, but Skeleton, Super Skeleton, Bones, and WPBS are a few I like. I’m also a fan of using the HTML5 Boilerplate and Twitter Bootstrap as a base (when appropriate). Studio Press is, of course, also a great option that comes with many premium benefits. Building a new site and converting an existing site are two completely different processes. Converting an existing site isn’t as easy as switching themes or making an existing theme ‘responsive.’ I suppose it can be done, but the end result may not provide the desired ux. Therefore, having a clear content and design strategy is still very important. I don’t think Robert was saying that having a responsive site was the end all to content strategy but rather one part in the process. And in terms of content strategy, building a new site or converting an existing site are exactly the same process. You’re going to think through it regardless and implement what you feel is best whether you’re starting from scratch or tweaking here and there. Conversion in terms of easiness is also completely relative. For example if you are running a blog on one of our existing themes and haven’t done major customization it really is as easy as switching themes to gain a responsive layout and better mobile conversion rates. Responsive is really where it’s at, and it’s something that I’m thinking of First when I redesign my website for this next round. But I would like to suggest that there is such a thing as mobile content marketing, but it all depends on the circumstance. Places like museums that offer free walking tours, or businesses that utilize services like Gowalla to offer tourist attractions and a little extra background, or a Pilates studio that gives a tour of the best places to buy equipment within a 3-5 mile radius of their location, couldn’t that be considered mobile content marketing? P.s The drudge report is awesome! This will be awesome for new designs or redesigns in the future in many cases. But far, far more trouble than adding a simple mobile plugin to current WordPress sites. All you have to do is get the logo right, select your most important buttons, and you’re done. My preference is something that loads fast and gets me the info I need. Don’t need any flash and dash. But on your full site, accessed by a desktop, laptop, or tablet, you sometimes want to take full advantage of things that would choke a 3g phone. If you cater too much to phones, you lose on desktop. For now, we’re keeping them separate with a simple addition of a simple mobile interface. I read recently (I thought it was CB but I can’t find the post) something like- “that giant slider of high-res photos of your gourmet dishes might be perfect for the desktop user checking out your restaurant, but the mobile user is most likely trying to find location and/or browse menu.” In this case a responsive theme falls short in delivering the appropriate content. I’m just now, myself, sorting out how to present all the various options for mobile UX to various client types. 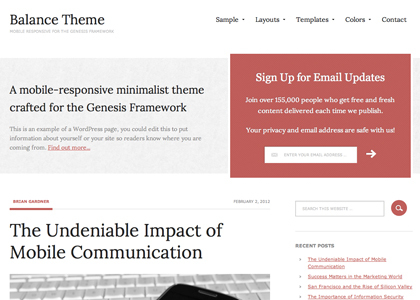 For all my coaches and blogging-intensive independants, responsive theme will be perfect. For others, generic brandable web apps I can redeploy over and over will be a perfect and affordable solution. Others will want fully custom web experiences (which means I get to use full creative juices!). But I want to *fully* agree that developing native, downloadable app is a complete waste of time and money for *most* cases. I think your Drudge example is proof enough of that. Great article, couldn’t agree more. 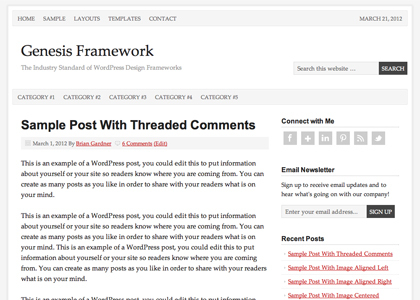 Though I’m not using Genesis or Prose, I -did- just install a responsive theme on our site. I think I’m going to be pushing clients to do the same in the future. There are still a few bugs in most of the responsive designs I’ve seen, including the one I’m using – video not resizing, causing the page to load improperly on mobile devices – some of the “dynamic” areas of the site not working properly when combined with other elements. Small things like that. But I’m still glad I made the switch – I have the potential to reach anybody now. Wow! This is a totally different perspective as compared to the general thinking out there. Mobile Responsive Design is a brand new term to me but it makes sense. Personally, I would think that the apps development for tablets and smartphones would continue to soar but this new perspective (at least to me) warrants a review in terms of it’s cost and administration effectiveness. I certainly agree that an app is useless for many publishers. And building a mobile version of your desktop site is a good first step. That puts you in the top 25% of publishers. However, there’s certainly more that can be done to deliver an exceptional mobile experience via the web. One obvious strategy is to make a local tie-in. If you’re Kraft Foods, for example, and you’re publishing on m.KraftRecipes.com, you could serve up recipes that are popular in certain geographies. You could serve up location finders for local grocery stores–or coupons for products that are popular in a certain location. The point is that a mobile web strategy can go so much farther than just a mobile version… Think about the needs of your mobile audience. What are they looking for? How are they different? Where are they located. 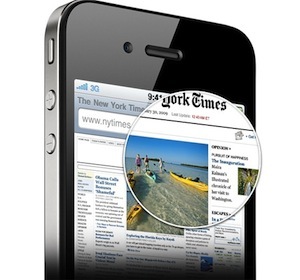 Once you’ve understood the mobile context, then design your mobile site for those needs. I’m interested specifically in the Enterprise theme, on which I have expended some time and effort. Would that be on your list, or is it only for new themes? I do agree we need to make an ” all for one and one for all” system, but until we get there, we will have scattered sites and apps. Some sites are great at making their offers usable on the bog screens as well as the little ones. So for now, marketing both is what we are stuck with. Excellent article, Robert. Thank you. When I first began pondering the Mobile mountain, the variety of proposed solutions–install this plugin, buy this app, sign up with Mobify or MoUse–set my head to spinning. Thank God I remembered I am a StudioPress member. I went to the blog and discovered my new site (powered by the eleven40 theme) is already Mobilized. Yes! You folks rock.